New functionality that allows an Item to exist in multiple count journals. It might have been a long while since I last blogged, but it’s been even longer since I had to fight with counting journals in Dynamics AX. Never the less, I spotted something count related in the December 2017 release of R3 that piqued my interest. * stictly speaking, you can count the same item in different journals, but only if you are counting it in different warehouses. These two limitations pose quite a problem when counting a warehouse that contains several thousand locations. You’d want to create multiple journals (perhaps one per warehouse aisle or area) so that you can spread the data entry burden across multiple people, but you can’t do that if there’s a chance that some items might appear in different journals. In fact, unless you modified the behaviour, you ended up with one very large count journal, and dozens of count teams standing around whilst the poor system administrator punched in all the counted quantities. I took a look in a test environment to see if this hotfix offers a solution to this problem…. The help text for the new field is long, and reads: Use this setting to control if counting should be registered as started for items on the journal lines. When enabled, an item with identical dimension values can only be included within the same counting journal. If disabled, counting will not be registered as started for warehouse items and an item with the same set of inventory dimension values can be included on any number of counting journals. If I create another count journal, I am able to add the same item, and both journals can be posted without error. Certainly it solves the problematic scenario I described above. Of course, you do have to be careful not to make the same count adjustment in multiple journals. For example, in Location 11, I have found one more of the item than AX expected. If I post this result in both journals, AX actually increases the On-hand quantity from 1.00 to 3.00! Despite this, I’d rather have the option to make that mistake than be forced to do the whole count in a single journal. 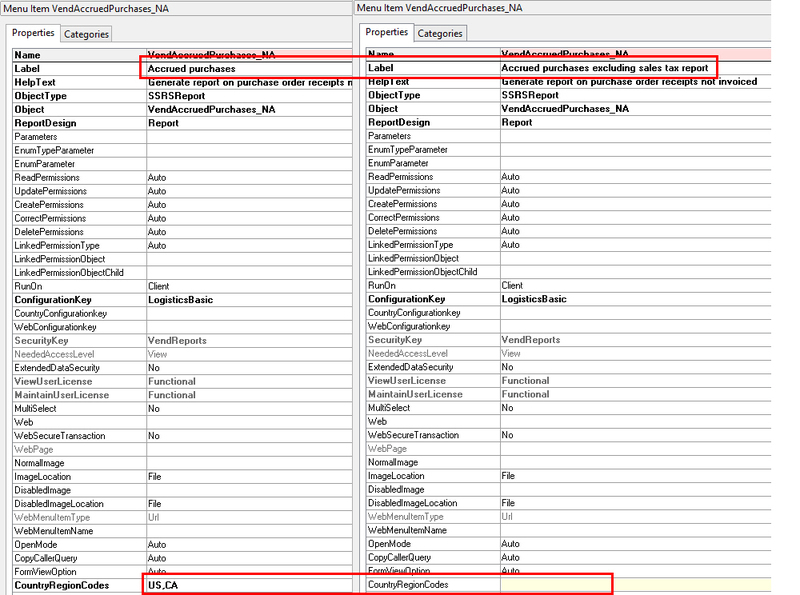 A review of KB4022327, which allows the Tracking Dimension Group and Reservation Hierarchy of an item to be changed. The Reservation hierarchy in Dynamics AX is the thing that enables two-level inventory reservation. Essentially, we get to choose if we want to reserve inventory at Batch and/or Serial level, or not. Once set, changing a Reservation hierarchy has been particularly difficult, especially because often this is being done in combination with a Tracking Dimension Group change. I knew for an upcoming project that I was going to need to change Items that were set as Batch-only to become Batch & Serial enabled. I had already dabbled with it, and found that you hit a catch-22; you can’t set a serial-enabled Tracking Dimension Group if your item has a Reservation hierarchy which does not have Serial in it…. and, well, the periodic job that exists for changing an item’s Reservation hierarchy did not seem particularly interested to do that for item’s which already have a Reservation hierarchy. (Rather, it worked for items which did not. This might be fine if you’re enabling warehouse management functionality in an environment for the first time, but was no good for me). It was whilst reviewing a list of recently released hotfixes (as I’m sure you all do) that I spotted KB4022327: ‘You cannot change Tracking dimension group (and Reservation hierarchy) for WHS enabled items’. It’s like it was written for me; how did they know! Although it was released in May, I only just got round to checking it out. The ‘Change tracking dimension group for items’ periodic job. There are some things that you need to do in preparation for running this job. Things that you would have to do anyway when you change a significant property of a Tracking Dimension Group…. You need to make sure that the Products (which are linked to your Released products) do not have a Tracking Dimension Group set. If they do, you can just remove it from the Product. You’re going to need to remove all inventory for the items. After doing that, you might think about doing an Inventory close (and therefore, when you do this for real, you might need to do it at a period end). The job will error if you have any open reservations. When you removed all inventory of the items, you would needed to remove all reservations anyway. The job will error if you have any open receipt transactions. It’s odd that I’m allowed to make this change if I have open sales orders, but not if I have open purchase orders. The very first link I posted at the top of this post says, in relation to changing a Reservation hierarchy, ‘all items must be purchased or sold’. If you decide to leave open sales orders, I suggest that you test that they can still be released/picked afterwards. After doing these things, the job worked for me on my test items. One less headache to worry about. AX 2012 introduced functionality to allow amendments to or cancellations of posted Sales order Packing slips (Delivery notes) and Purchase order Product receipts. The functionality was an improvement over the solution available in AX 2009 and earlier, which was to create an order line for an equal but opposite quantity and post that on another packing slip, effectively reversing the earlier posting. 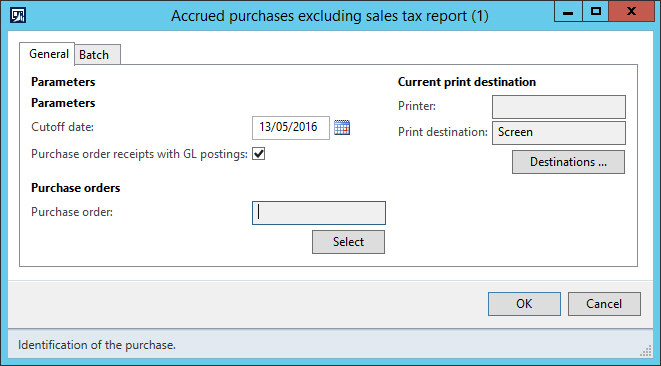 As if to to confirm the that new functionality was the correct way to handle adjustments to posted packing slips and product receipts, the ability to reverse the posting using the AX 2009 method was removed in AX 2012. This was all fine, until the release of AX 2012 R3 and the Warehouse management module. The functionality to Cancel or Correct Packing slips and Product receipts did not work well in scenarios which involved Warehouse management processes (with Loads, Shipments and the like), and with the release of CU9 the functionality was actually prohibited in these cases. The good news is that Microsoft have reintroduced the functionality to WHS scenarios with CU12 – and you can get it now via hotfix KB3196554. I installed it into my R3 CU11 demo VM so that I could take a look. A maximum of one of these buttons will be available at any time, depending on which action is appropriate for the direction and status of the Load which you have highlighted. And you’ll also notice that it is now possible to Reverse the Confirmation of a Sales order Shipment (although it is still not possible to do that for a Shipment linked to a Transfer order). After a quick look at the functionality, it seems that if you want to cancel a Sales order packing slip, you must do it from the Load; which is fine, because all Sales orders have Loads (even if you aren’t particularly using the Load functionality). However, you can also cancel a Purchase order Product receipt from the Product receipt journal, which is good, because the use of a Load is optional for Purchase order receipt. The functionality in this R3 hotfix is also included in the November 2016 update for Dynamics 365 for Operations. In the U.K., a report to show Goods Received Not Invoiced (GRNI) seems to be a common requirement. Dynamics AX 2012 has an Accrued purchases report which fits the bill, but unfortunately this report has been enabled only for legal entities operating in the USA and Canada. As a workaround, I have been known to suggest using appropriate filtering on the the inventory transactions table, but this did not stop at least three projects I have worked on requesting that we enable the real Accrued purchases report. Microsoft have provided a short example of how it is possible to remove the regional restriction on this report, but I recall the date field on the dialogue box also needed modifying to recognise dates in the UK format, so I think that this example could be a bit lacking. Luckily, all of these problems are resolved by a hotfix that was released at the end of April for Dynamics AX 2012 R3. The hotfix is KB 3160455 and is titled ‘Accrued purchase report can be available for all countries’. I installed it into my demo VM so I could take a look at it. And at the bottom of the last page, there is a grand total. Comparing it to the output from the report in an R3 CU8 system that I have to hand, it seems that one column ‘Value of line of PO’ has been removed, but otherwise the output is the same. A colleague pointed me to a hotfix that will be released in AX 2012 R3 CU10. The hotfix is KB3061216 and is called ‘Support for new DIXF entities’. The hotfix description lists fourteen AX modules and shows the number of new entities in each module; in total 226 new entities. But it doesn’t tell you what the new entities are. I only knew one way to find out, so I installed it into my R3 CU9 Demo VM. Since I wanted to know which entities were new, first, I dumped a list of the entities that I had in CU9 into Excel; 238 in total. And then I installed KB3061216. And after completing the software update checklist, I rushed to the ‘Target entities’ form and hit the Export to Excel shortcut. And I still had 238 entities. Hmm. Not what I was expecting. Perhaps the list needs refreshing. I looked around for an option to do that, but couldn’t find one. What if I delete them all, and then re-open the Target entities form? Worth a try – and that did it. Now I have 467 entities. That’s a whole 229 new entities. Actually, I did some comparisons and found that two of the entities in CU9 had disappeared – ‘VendPaymFee’ (Payment fee in the A/P module) and ‘Terminals’ from the Retail module. So that’s 231 new entities. What are they all? To save you the bother of installing the hotfix to find out, I’ve attached an Excel list of all 467 entities. In the list, the lines in green are entities that were added by the hotfix. I don’t know if any existing entities have been extended – I took a look at the Product entity and it appeared that it had not been. Let me know in the comments below if any entities you’ve really been waiting for have been added. Author GuyPosted on November 14, 2015 Categories Microsoft Dynamics AXTags DIXF, KB30612162 Comments on How would you like to double the number of DIXF entities you have? 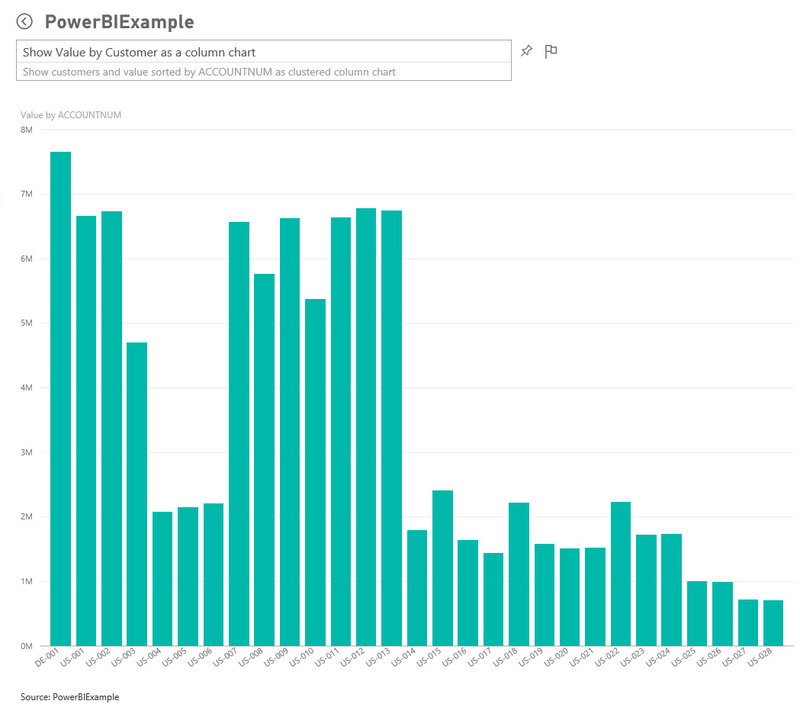 Earlier in the year, I took a look at Power BI, and tried to find out what it could do with AX data. 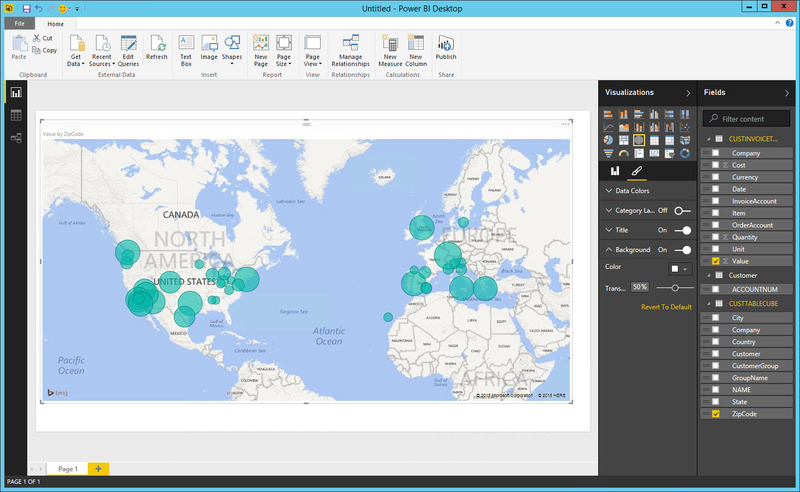 My ambition was to use Power BI’s natural language search to build reports on AX data. 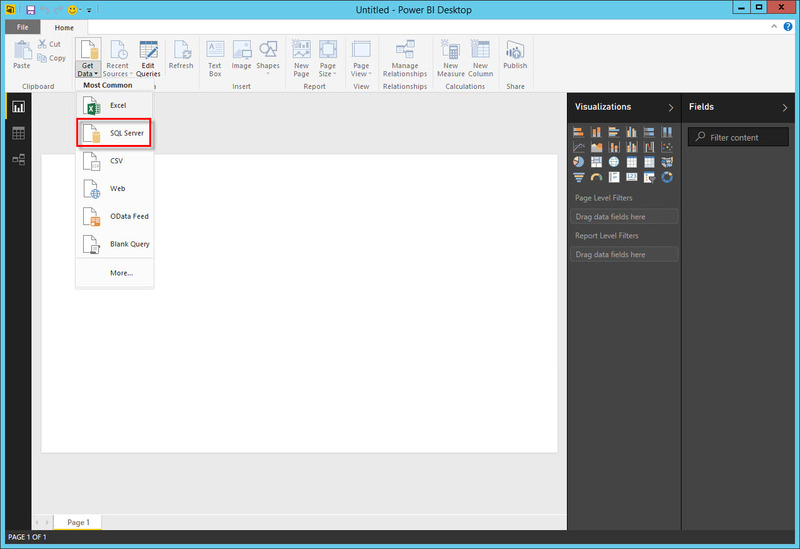 Natural language search (called Q&A in Power BI) allows you to create reports by typing english sentences – such as ‘Sales by Month’. In the end it didn’t go quite as well as I’d hoped. I couldn’t get the PowerBI.com website to look at my on premise SQL database, and I couldn’t get it to look at the standard AX Cubes. But the post did end on an optimistic note – support for the functionality I was looking for was either in development or being planned. Since then, Power BI has come out of Beta. 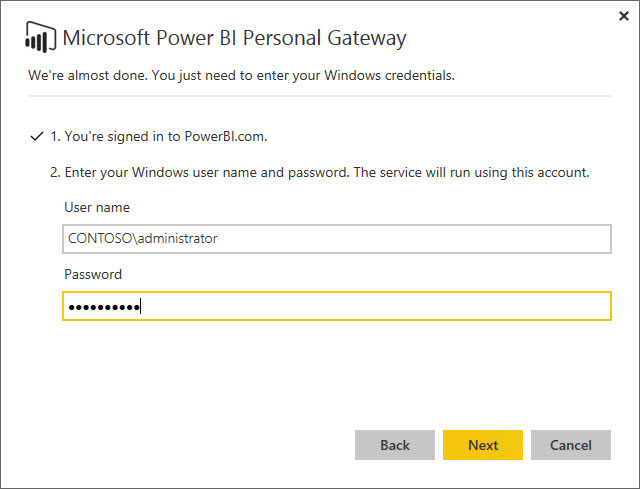 And it has had lots of updates; specifically, the Power BI Personal Gateway, which allows you to connect PowerBI.com to your on-premise SQL database. (I still can’t connect to the AX cubes – that work is not yet finished). 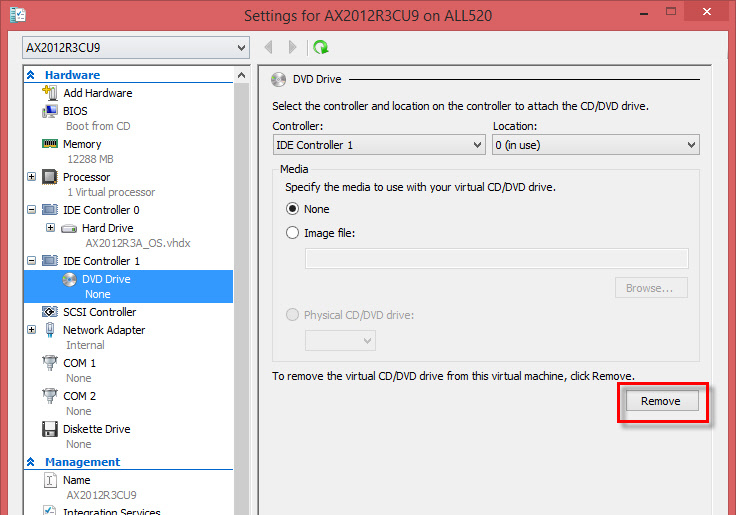 So with my AX 2012 R3 CU9 Demo VM, I thought I’d take a look at it in action. There are some limitations about where you can install the Personal Gateway. It must be on a 64bit Windows operating system, and you’ll probably want to install it on a device which is left powered on (at least, in real use you will. For this test, I installed it into the CU9 Demo VM). 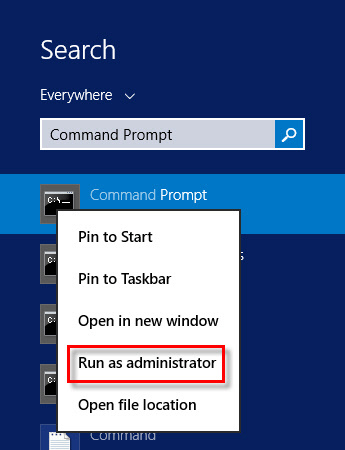 Whilst running the install, its worth being signed in as a user with Windows Administrator permissions. If you do this, the Personal Gateway will install as a Windows Service, and will run even if no-one is signed onto the computer. And after that, my data can refresh. I also have the option to schedule a refresh (up to eight times per day), and as long as my Personal Gateway is running, the data will refresh for me. Result! And that is not a dream – work has already started. You can even see it demonstrated by Joe Belfiore in the Ignite 2015 Keynote (skip forward to 00:45:30). This is all very nice, but I live in the AX world. Why should I be bothered? I’ll leave you with one more thought. If you look hard enough, you’ll see news is also coming out about tighter integration between Power BI and the yet-to-be-release AX 7, and that’s enough to keep me interested. 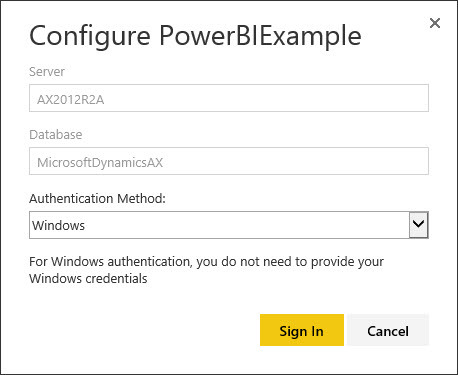 Recently, Microsoft released an updated Demonstration VM for Dynamics AX 2012 R3 CU9. You can find it here on PartnerSource, and here on CustomerSource. 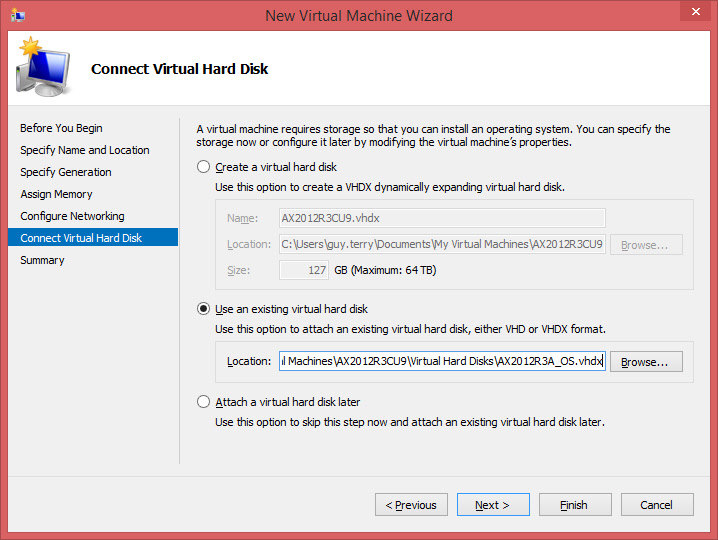 For the last VM (CU8), I converted both the Virtual Hard Disk files (VHDs) and Virtual Machine Generation to the latest version supported by Hyper-V. I also made some other tweaks which might help with performance. Doing it again now for the CU9 VM, I thought I’d write down the steps. I’ve put them here for everyone to read, but this is a really long post, and gets quite technical (in a non-AX way) in places. If this doesn’t sound like something you want to do, I’d stop reading now. It might be that I’m the only person who finds this interesting or useful. If that’s the case, at least I’ve got it written down for next time! The download for the Demo VM is spread over 38 files (each 1GB in size), so go ahead and download those, and come back when you’re finished. It will trigger the unpacking of the 38 files, one by one. You can set the same folder you’ve used before as the destination for this step. Be aware that whereever you do it, you need nearly 110GB of free space. It will take a long time to complete – almost as long as it took me to download the 38 files in the first place. When it’s done, you’ll have a word document, and a folder containing the VHDs and configuration of the Virtual Machine. 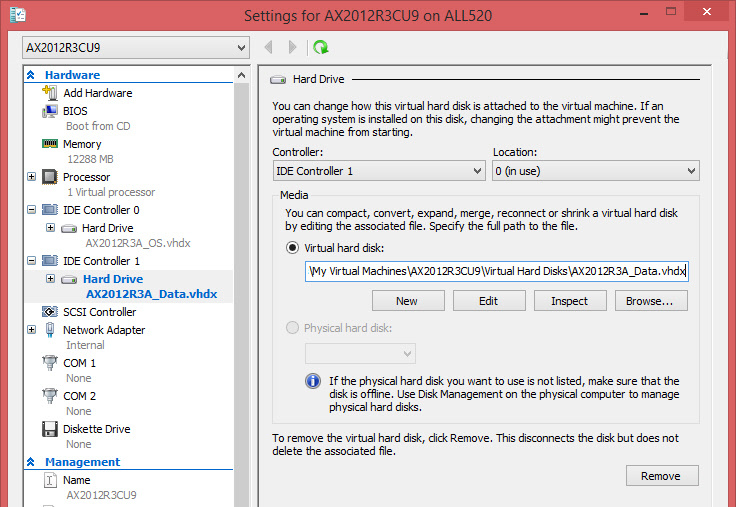 The VHDs are the ‘virtual hard disk’ files used by the VM. They are the VM’s C: and E: drives. C: contains Windows and the applications. E: contains the SQL database files. At this point, you can delete the file you downloaded called ‘AX2012R3CU9DemoVMA.exe’. You’ll not need it again. You can also delete all of the files with the word ‘part’ in the name. Or, if you think you’ll need them again (maybe you’ll kill this instance of the VM one day, and want to start again), I normally copy them off to an external drive. Either way, we don’t need them now. Before we boot it up, we’re going to convert the VHD files to the VHDX format. After we’ve booted it up (and made an important change within the VM) we’re going to convert the VM to Generation 2. If you’re hoping to squeeze better performance from your VM because of this, there is a crumb of hope for you. The VHDX format includes support for something called ‘4K logical sectors’. This is something that is only supported in the latest releases of Windows, and offers the potential for a performance increase. Convert-VHD -Path "C:\AX2012R3A\Virtual Hard Disks\AX2012R3A_OS.vhd" -DestinationPath "C:\AX2012R3A\Virtual Hard Disks\AX2012R3A_OS.vhdx"
If you did not put your ‘AX2012R3A’ folder into the root of the C: drive, you’ll need to modify this. This step will require around 115GB free for the new VHDX files that get created. I have room for them on my C: drive, so I created them in the same place as my VHD files. If you don’t have room, modify the DestinationPath to create them on a different drive. Convert-VHD -Path "C:\AX2012R3A\Virtual Hard Disks\AX2012R3A_Data.vhd" -DestinationPath "C:\AX2012R3A\Virtual Hard Disks\AX2012R3A_Data.vhdx"
You can now delete the old VHD files, but leave the VHDX files alone! I also don’t like the name AX2012R3A, since no doubt the CU10 Demo VM will have the same name, and I won’t know which is which. So I rename it AX2012R3CU9. Finally, I’m not going to use the VM configuration provided by Microsoft. It is the XML file that is in the ‘Virtual Machines’ folder, and I’ll delete it that file. The configuration already won’t work, because it is looking for VHD files (and we don’t have any). It also wants a network card called ‘AX2012R3’, and that isn’t what mine is called. Instead, we’ll create a new configuration now. But first, we need an Internal network card to give to the VM. 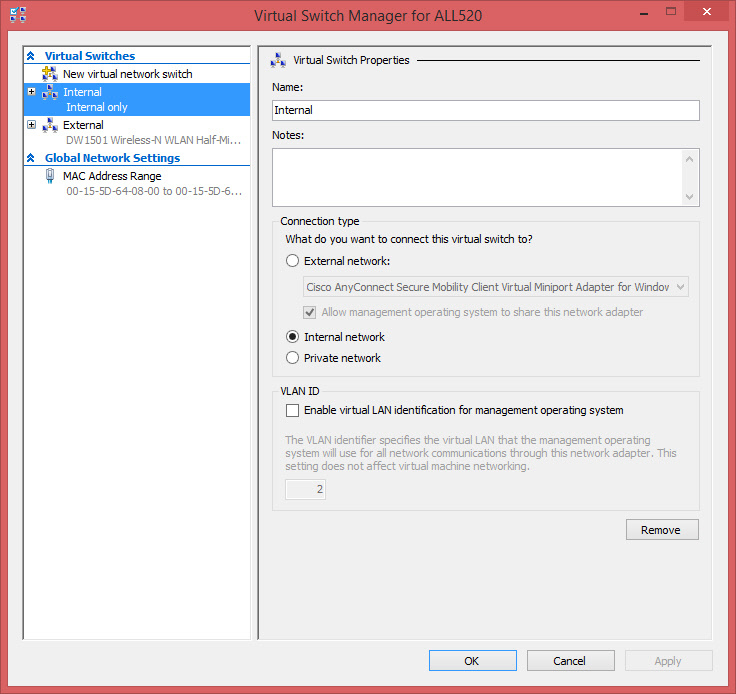 Open Hyper-V Manager, and then ‘Virtual Switch Manager’. (If Hyper-V Manager is not installed on your PC, you can add it by ‘Turn Windows features on or off’). If you already have an ‘Internal’ switch, that’s fine. If not, hit ‘Create Virtual Switch’. Call it ‘Internal’, and set the type to ‘Internal network’ then click Apply and OK. When I’ve added the second Hard Disk, I’m ready to boot up the VM. Close the ‘Settings’ window, and Start the VM. Once it has booted (and after you’ve logged in), I suggest going to Control Panel -> Network and Internet -> Network Connections, and re-naming the connection that exists to ‘Internal’. Later, I add an ‘External’ card, and knowing which is which might be useful one day. Whilst we’re in here, check the IP address that the Internal adapter has. If it begins with 169., it’s not got the right address. There’s a utility in the root of C: drive on the VM which will fix that. 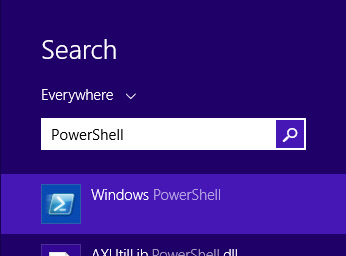 Browse to the utility (it’s called setnetworkip), right-click on it and choose ‘Run with PowerShell’. The utility will look for network adapters with an address in the 169. range and assign the correct address (in the 10.20.12.x range) to it. The network adapter should remember the address it’s been assigned, so you shouldn’t need to run this utility again. Now at this point, we start the conversion of the VM to Generation 2. 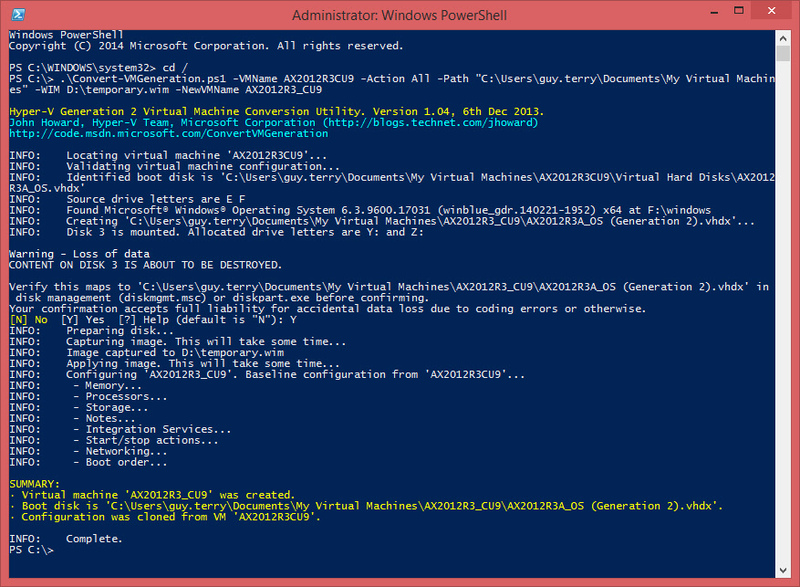 Generation 2 VMs are only supported by Windows 8.1 (or Windows Server 2012 R2, and I assume Windows 10). If you don’t have Hyper-V running on those operating systems, don’t do the conversion to Generation 2 part of this blog post. Hopefully I’ll remember to enable that again later, after we’re done. Now, we’re ready to start the conversion, so shutdown the Demo VM. If you do it right, Hyper-V will report the ‘State’ of the VM as ‘Off’. Once that is done, close Hyper-V Manager. Now you need to download a utility called ‘Convert-VMGeneration.ps1’. You can get it from Part 10 of that blog. I save it to the root of C: drive. I’ve told it the name of the VM I wish to convert, and I’ve told it the ‘Path’ to put my new VM in. The ‘WIM’ parameter tells it to temporarily create a file on my D: drive, and the final parameter is the name of my new VM (it has an underscore in it to differentiate it from the old VM). You’re on your own at this point. If it has got it wrong and you lose something important, I can’t help you. If you’re not comfortable, answer ‘N’ and skip this part of the blog. I checked in Disk Management and I can see that all my important data is on Disk 0 and Disk 1, so I answer ‘Y’. 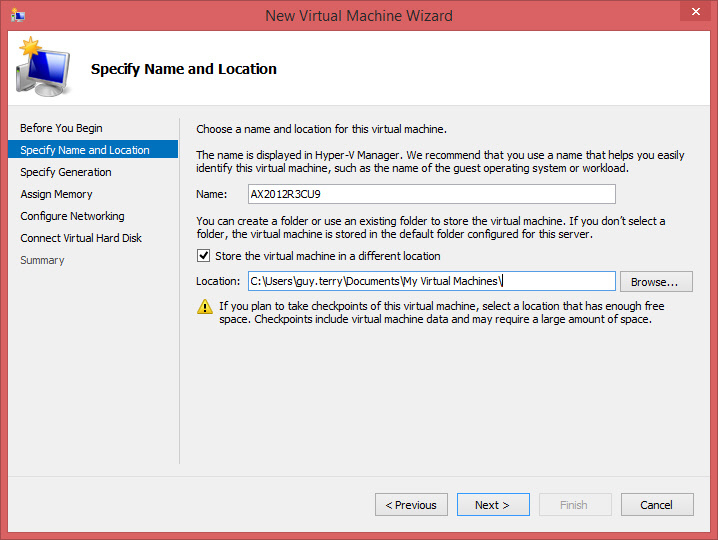 The new VM appears alongside the original in Hyper-V Manager. I have to do a little tidying. I delete the original VM. The utility has only converted the boot disk. The E: drive is attached to the new VM, but in its old location. So I remove the second disk from the VM, move the Data VHDX file to the location I want, and then add the second disk back to the VM. I also give the VM 4 processors, instead of 1. If you were skipping the ‘Convert to Generation 2’ part, this is where you pick up again, because unfortunately, we’re not done there (although you should find AX works fine, and you can use the VM). The VM Profile Manager makes a welcome return in the CU9 Demo VM, and by default it is set to give you the full demo experience. Personally, I don’t need any of the Retail POS stuff, so I open the VM Profile Manager, and on the ‘Settings’ tab I set the profile to ‘Minimum’. Shut down the VM, so that we can check the VM Profile Manager loads a smaller set of applications when we re-boot. But whilst it’s shut down, I create a second switch in ‘Virtual Switch Manager’. This time, it’s an external one, and will allow the VM to communicate to the internet. When you create the switch, select whichever network adapter you want it to use to access the internet. I normally choose my wireless adapter, since it is much more likely that I’ll have a wireless connection than a cabled one. Add this new ‘External’ adapter to the VM, and power it up. This time when I boot, I can see a whole bunch of windows services (e.g. ten with Retail Commerce Data Exchange in the name) which haven’t started. Good! Go to Control Panel -> Network and Internet -> Network Connections and rename the new network connection ‘External’. They’ll take effect the next time you reboot the VM. So that’s pretty much it. There are other things I do, which I won’t write about here. 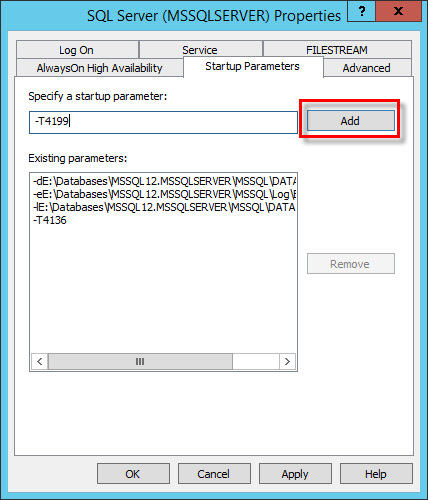 You might put the latest SQL service pack and CU on (SQL Server 2014 RTM is on the VM). You might install the latest windows updates. I set the Time Zone and other language settings in Windows to United Kingdom. I turn off a lot of stuff in the AX Licence Configuration that I will never use (like some Russian functionality, US Payroll stuff, the Public sector functionality) or functionality that barges its way onto many forms (e.g. Catch weight). You might also want to think about disabling WMSII (since it’s not supported with Warehouse management). Well, that was far too long a post. Its my notes for the next time I do this really, but if it helps one or two others then that’s even better. guyterry's Dynamics AX blog Blog at WordPress.com.